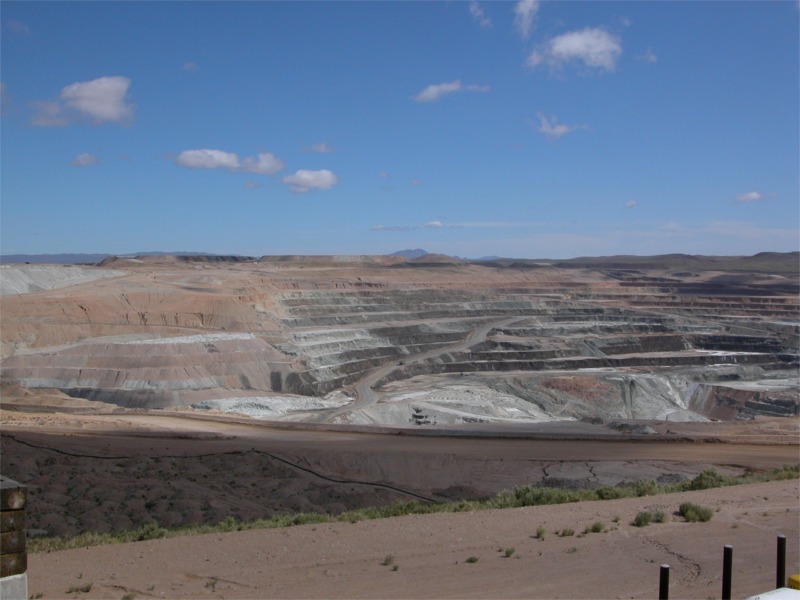 click photo to enlarge This is the Borax mine in the upper desert in Boron California. 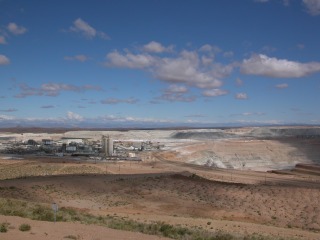 Over half the worlds borax is mined here. We have seen the roots of this mine in Death Valley. click photo to enlarge You can't actually go down in the mine. 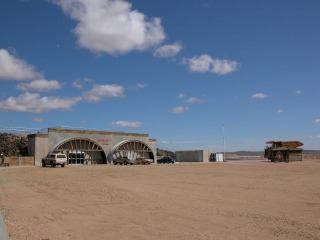 Instead they have built a visitors center high up on a hill where you have a great view of the operations. They charge a nominal fee to visit per car ($2) and all proceeds are donated to charities. click photo to enlarge This is one of their older trucks. It is not the latest and largest of the new fleet. 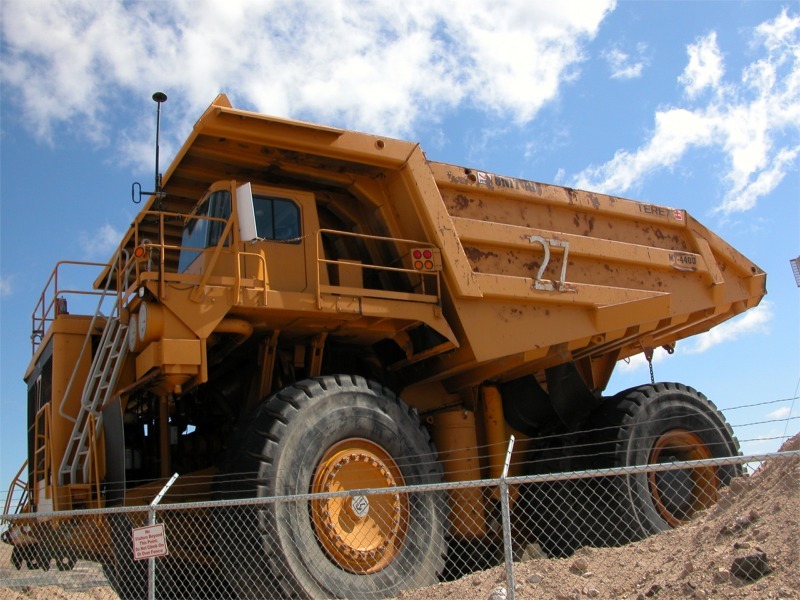 It is a190 Ton truck meaning the bed can carry 190 tons. The newer trucks hold 240 Tons. The tire on this thing is 11 feet high and 3 feet wide. The tire weighs 6305 pounds. Normal tire life is 9,000 hours but since they are run 24 hours by 7 days a week one year is 8,736 hours. 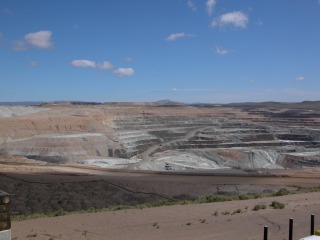 click photo to enlarge The mine is 1 mile wide by 1-1/2 miles long. It made for a very informative stop. 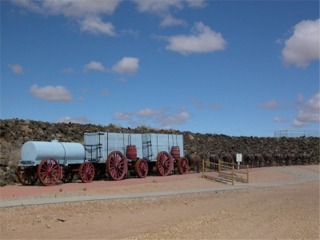 There are also 2 very good museums in Boron but we saved them for another trip. click photo to enlarge This is a picture of the Twenty Mule Team replica they have outside the visitors center. When Borax was first discovered in Death Valley they used to use these to get the ore out of the valley and take it to Mojave to be shipped by rail.